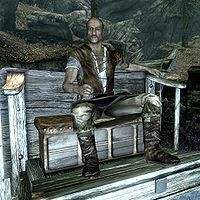 Thaer is a Nord warrior, and the Solitude carriage driver. He wears a set of farm clothes and a pair of boots. He is equipped with an iron war axe. If you ask him what he knows about Solitude he'll tell you, "Solitude's been the capital of Skyrim as long as I can remember. Most of the High Kings of Skyrim were Jarls of Solitude first. Ah, lets see, what else... the Bards College is here, and the main office of the East Empire Company. If you need it, you can get a room for a fair price at the Winking Skeever, just inside the main gate." Dawnguard added a second Thaer that might have been planned as a replacement, but was never actually used. This page was last modified on 9 October 2014, at 23:49.